At the weekend I like to indulge in this luxurious breakfast. Sometimes I find shop bought granola a little heavy to digest. The coconut oil and maple syrup in this recipe is the perfect balance for me, not too heavy or sweet and packed with flavour, very satisfying. My husband who loves his hearty breakfasts gave this the thumbs up! Feel free to use whatever nuts and seeds of your preference and don’t feel restricted by this recipe but I feel the combination of flavours on the recipe below works really well. Prep time – 10 mins. Pre heat your fan oven to 190C. Line a baking dish with baking paper. Put your oats, nuts, seeds, cinnamon, maple syrup and almond butter in a mixing bowl. Place the coconut oil in a small pan and melt over a gentle heat to melt. This should take around one minute and then add to the oat mixture. Mix all the ingredients well to ensure the oat mixture is coated with the oil, syrup and butter. Once mixed, transfer to your prepared baking dish and bake for 10 minutes. 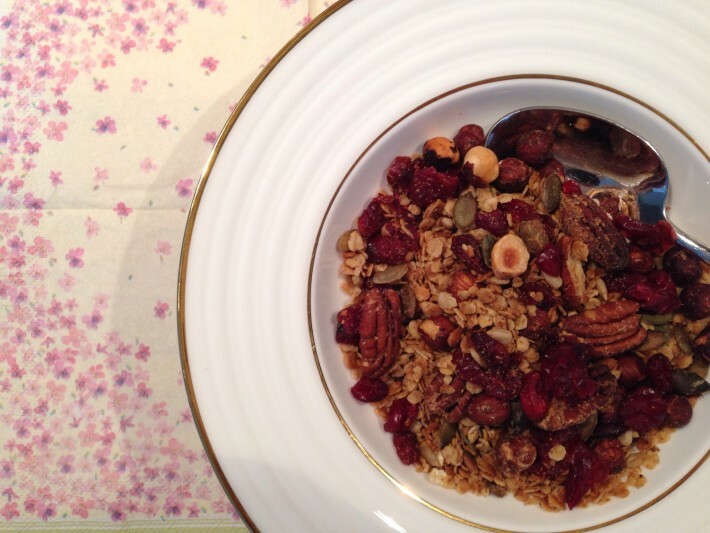 Stir the granola at 10 minutes and 20 minutes to ensure the nuts don’t burn. Add your cranberries at 20 minutes to prevent them burning and this ensures they retain their attractive ruby red, jewel like appearance. Once cooked and your granola is crunchy, allow to cool. Then transfer to an air tight container and enjoy as a hearty breakfast or add to a yoghurt or smoothie for a tasty topping. Pumpkin seeds are a great source of essential fatty acids (EFAs), vitamin E, iron, calcium and magnesium. The membrane of each cell in your body is made up of a phospholipid bilayer ( a fatty layer). This membrane controls the passage of nutrients into and out of the cell. Essential nutrients in, waste products out. By keeping your cell membranes plenished with EFAs you help each cell work to its optimum. A well functioning membrane prevents dehydration and removes wastes efficiency thereby keeping your skin plump, hydrated and clear. One Response to Goodness gracious Granola!